Spiders are icky creatures that no one wants around, but they still show up against our wishes. You’ve probably spotted one in your bathroom or basement before, only to have the living daylights scared out of you (and their potentially venomous bites are scary enough). But you don’t have to live with the fear of spiders becoming your new roommates. Take action, and keep your home or business away from any of their eight eyes’ sights. 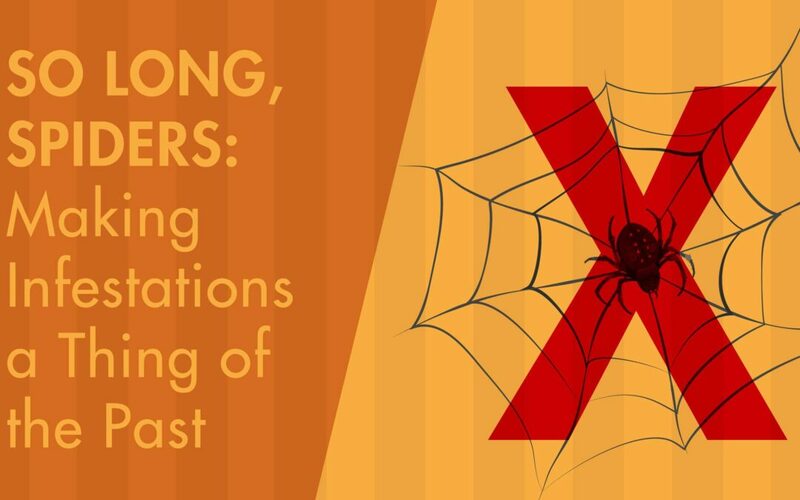 While shelter from the cold brings many pests indoors, it’s not a motivator for spiders. Arachnids can endure near-freezing temperatures, and with our Southern California winters rarely dropping below 50 degrees Fahrenheit, they don’t need our warm buildings. In fact, most species aren’t even adapted for indoor conditions, as they’re too dry and have too few insects to eat. So, why do they come in? The truth is that spiders don’t always come inside on purpose. When mating, male spiders become more mobile, making them likely to accidentally wander into homes and businesses. There are a few species (namely, house spiders) adapted to the indoors, spending most – if not all – of their lives within buildings. But many others may show up on your property, from the dreaded black widows and brown recluses to multiple types of sac spiders. So, knowing this benefit spiders provide, the question becomes, “How do I stop them without letting the pests they eat run rampant?” The answer is simple: Be strategic. Strategies: Caulking is an effective way to seal any cracks or gaps. You might also consider installing door sweeps on all your doors to keep spiders from squeezing under them. If you notice any screens that are broken, get them fixed or replaced. Also, installing wire mesh on your vents is a good idea; the tiny holes allow air to ventilate but keep spiders and other pests out. Taking away entry points is a great start; still, no home is 100 percent insulated from outside intrusions. Eventually, you may have an infestation on your hands, and you won’t know it immediately. Remember that spider you spotted in your basement? It likely didn’t show up yesterday. Don’t freak out too much, but it may have been there for weeks, or even months. It’s fair to say that spiders are fantastic at hide-and-seek. Be proactive, and keep them from winning. Strategies: Spiders love dark places with lots of clutter, like basements, garages, attics, or closets – clean them out if they seem at risk. Vacuuming and sanitizing discourages the building of spiderwebs. Outside, remove firewood and foliage to keep them away from your property. By doing all of this, you’re also making it unlikely other pests will find nesting places, either. As we stated earlier, spiders are beneficial because they eliminate other annoying (and often harmful) pests. As carnivores, they consume 16 times more meat than we do each year – estimates are as high as 800 million metric tons worldwide. That just goes to show how important the presence of other pests is to their survival in your home or business. But if you don’t want them in or around your property (and we totally understand if you don’t), the solution is obvious. 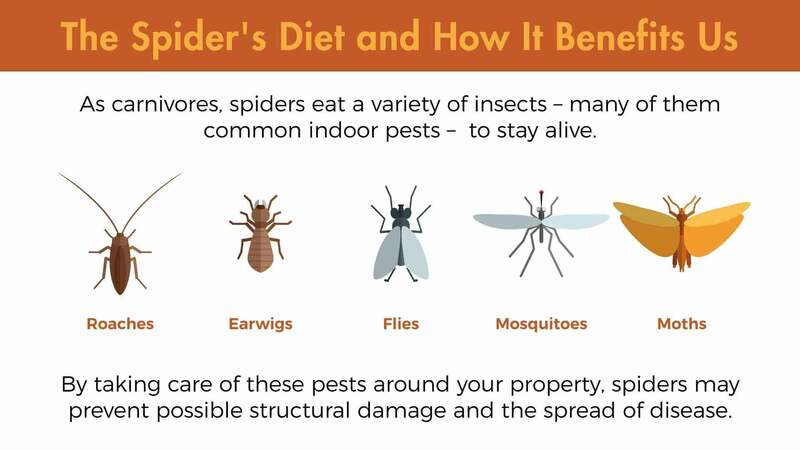 Get rid of other pests’ food sources, and you’ll be getting rid of spiders’ food sources at the same time. 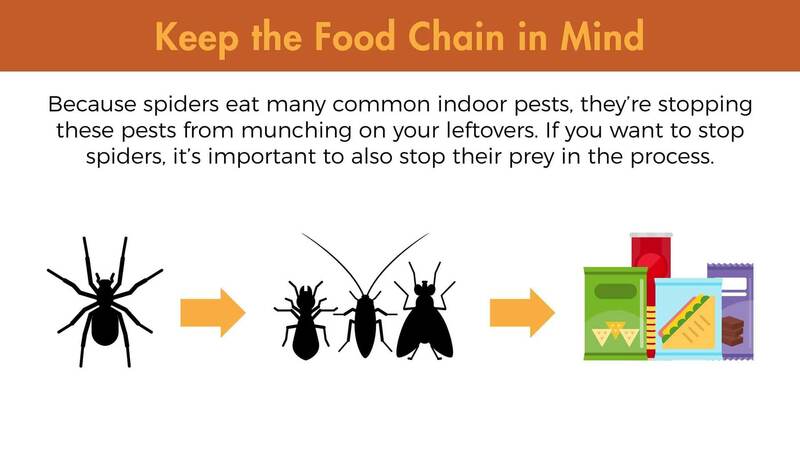 Strategies: Every food group supports pests of some sort. Roaches crave sweets, meats, and starches; earwigs gravitate toward fruits and vegetables; and flies go for just about everything. Taking away their access to food and water is crucial. Cleaning up spills, keeping containers closed, and fixing leaks are the most effective ways to prevent pests – and resultantly, spiders – from flocking to your home or business. Even by using all these previous strategies, you might still have spiders show up. 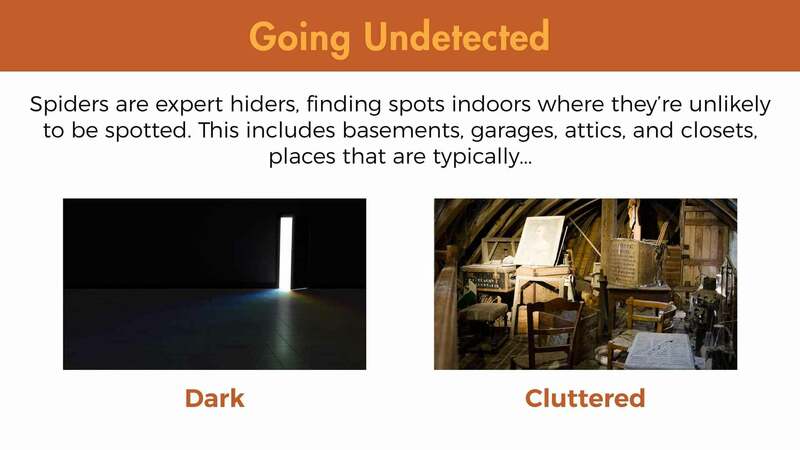 Despite our best efforts, they’re still experts at entering, hiding, and hunting (it’s not always easy to stop pesky insects like flies and mosquitoes, as you probably know from experience). As a result, you may still run into spiders and need to take more drastic measures to stop them. Yes, we’re talking about confronting them head-on. Strategies: “Contact kill” is a great way to get rid of spiders; grab your nearest newspaper, shoe, or other object you don’t mind getting guts on, and smash them on sight. If you’re nimble (or brave) enough, catching them in a jar to release outside also works. However, spraying your home with pesticide isn’t as effective, as the chemicals only get on spiders’ legs and are not ingested. A big issue with spider killing is that the species you’re taking on might be venomous. For all you know, you could be dealing with black widows or brown recluses. To be safe (both figuratively and literally), you may be better off calling in a professional at this point. Even with the ecological benefits spiders provide, you may still want them gone. In addition to their downright ghastly appearance, their potentially hazardous bites are a good reason to get professionals to do the job. At Lloyd Pest Control, we’ll safely eliminate the most problematic species while also offering specific preventative tips. Contact us to get a free quote for spider control for your Southern California home or business.